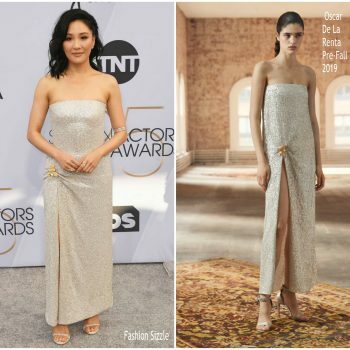 Constance Wu was in attendance at the 2019 SAG Awards on (January 27). 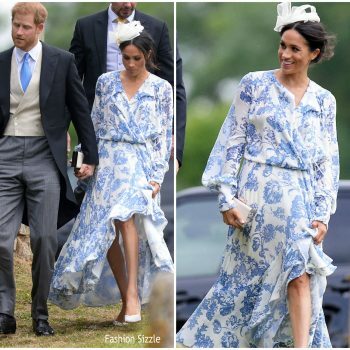 She wore a strapless Oscar de la Renta Pre-Fall 2019 gown styled with Stuart Weitzman heels along with Harry Winston jewelry. 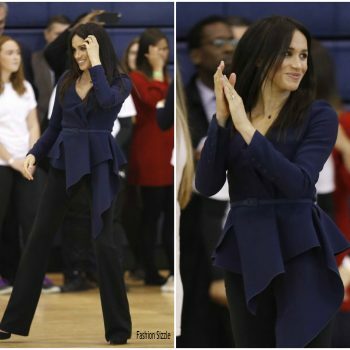 Julia Roberts attended the ‘Ben Is Back’ New York premiere on Monday (December 3). 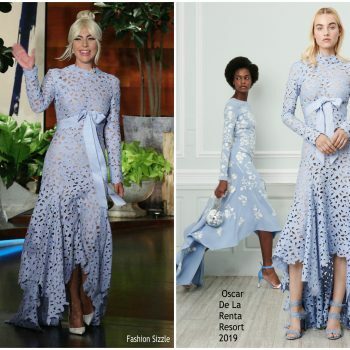 She wore a Oscar de la Renta Resort 2019 design styled with Graziela Gems and EF Collection jewelry. 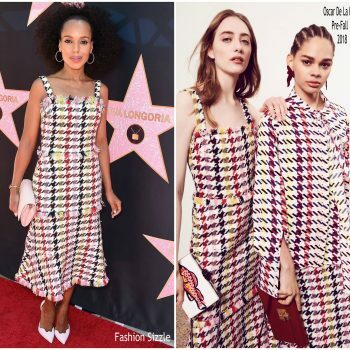 Nicole Kidman was in attendance at the 32nd Annual ARIA Awards 2018 at The Star on November 28, 2018 in Sydney, Australia. 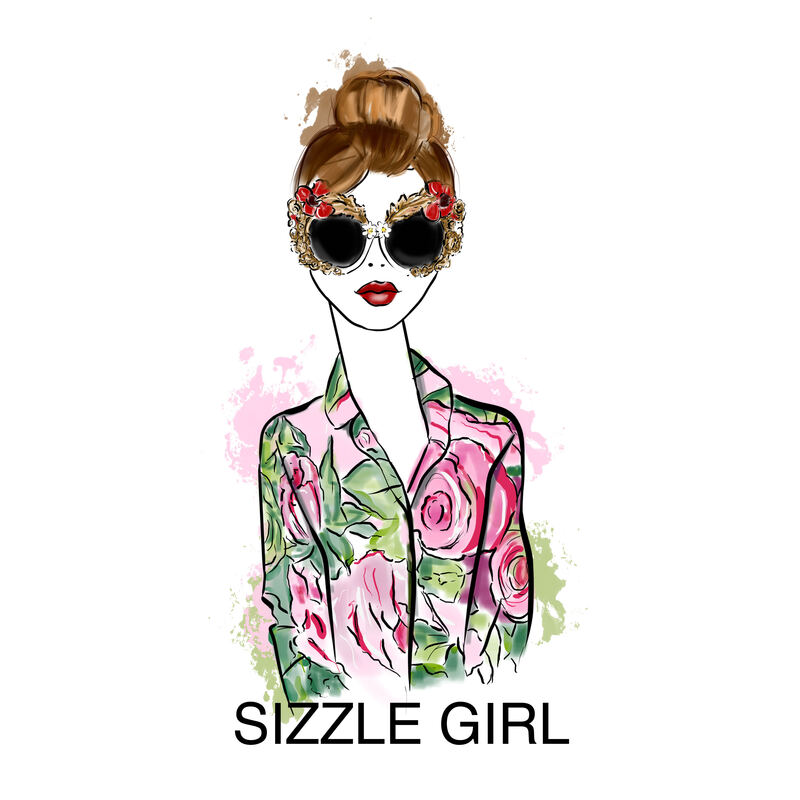 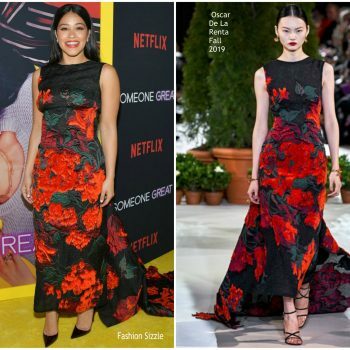 She wore a Oscar de la Renta Spring 2019 design. 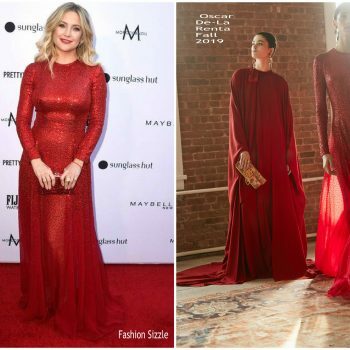 Amber Heard attended the 2018 Glamour Women of the Year Awards on Monday (November 12) in New York City. 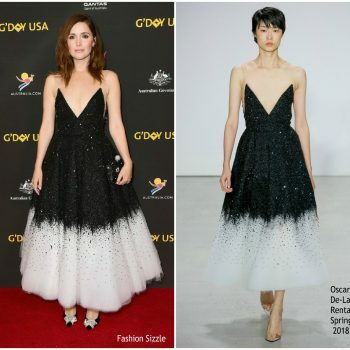 She wore an Oscar de la Renta Spring 2019 dress. 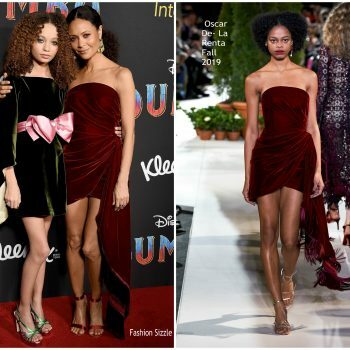 Andi Matichak, attended the Halloween premiere on Wednesday night (October 17) at the TCL Chinese Theatre in Hollywood. 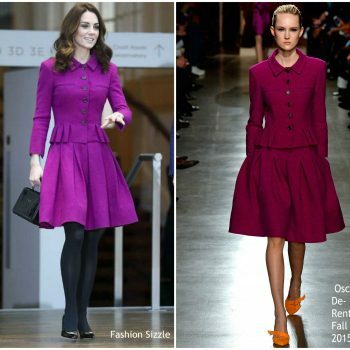 She wore a Oscar de la Renta dress. 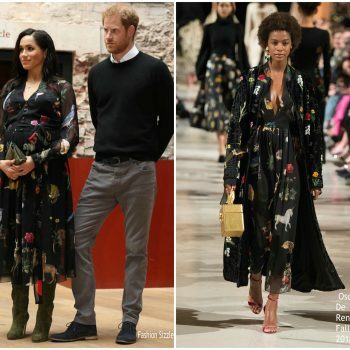 Claire Foy was in attendance at the ‘First Man’ premiere at the National Air and Space Museum on Thursday (October 4) in Washington, DC. 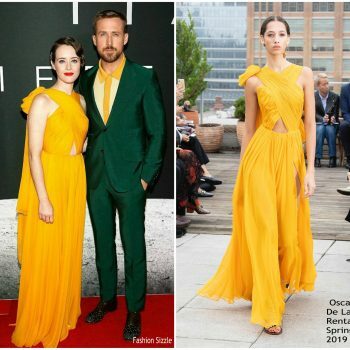 She wore a Oscar de la Renta Spring 2019 dress. 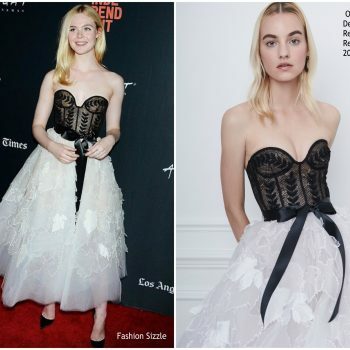 Elle Fanning attended the ‘Galveston’ LA Film Festival Premiere on Sunday (September 23) in Culver City, California. 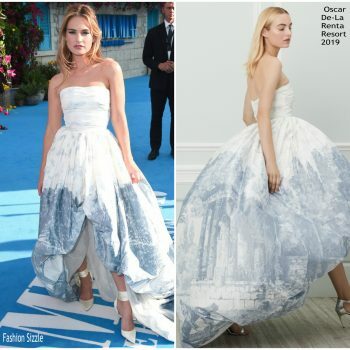 She wore an Oscar de la Renta Resort 2019 gown. 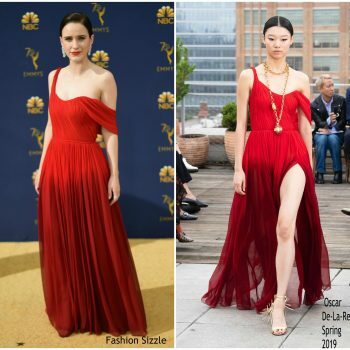 Sarah Paulson wore a black Oscar De La Renta Spring 2019 tea-length gown to the 2018 Emmy Awards. 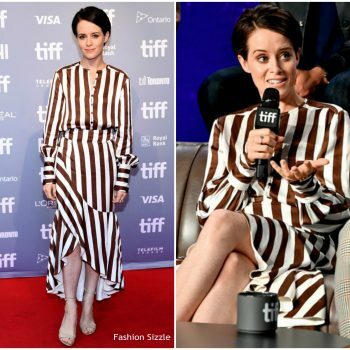 Claire Foy attends the "First Man" press conference during 2018 Toronto International Film Festival at TIFF Bell Lightbox on September 11, 2018 in Toronto, Canada. 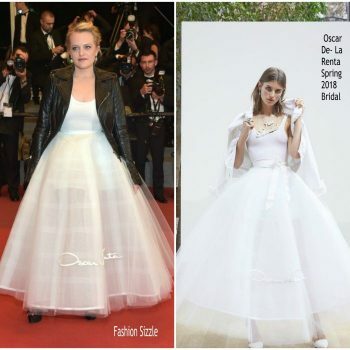 She wore an Oscar de la Renta dress. 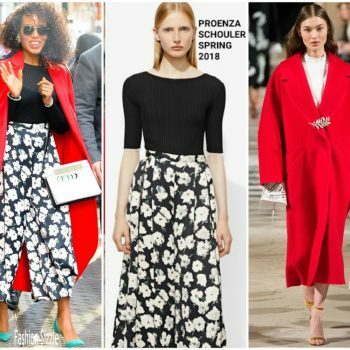 Maggie Gyllenhaal was in attendance at ‘The Kindergarten Teacher’ premiere during the 2018 Toronto International Film Festival on Thursday (September 13) in Canada. 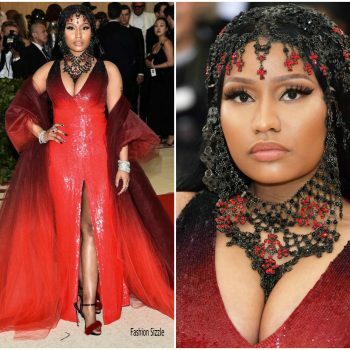 She wore a black Oscar de la Renta dress. 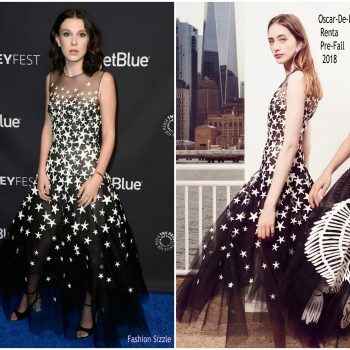 Raffey Cassidy attended the premiere of their new movie Vox Lux during the 2018 Venice Film Festival at Sala Grande on Tuesday (September 4) in Venice, Italy. 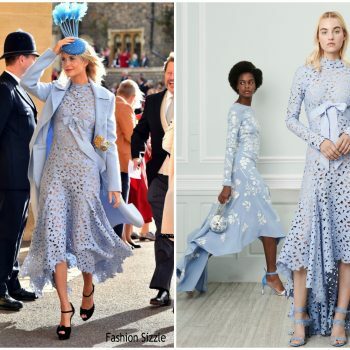 She wore a light blue Oscar De La Renta Resort 2019 gown . 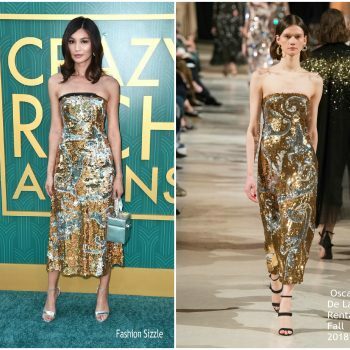 Gemma Chan attended the premiere on Tuesday (August 7) in LA. 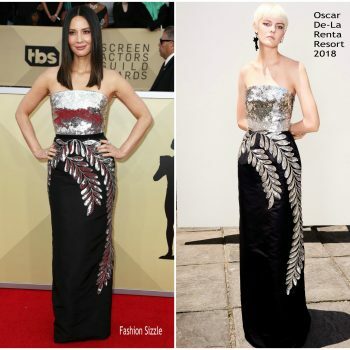 She wore a strapless Oscar de la Renta Fall 2018 dress styled with Gemma’s Chopard jewelry and silver heels. 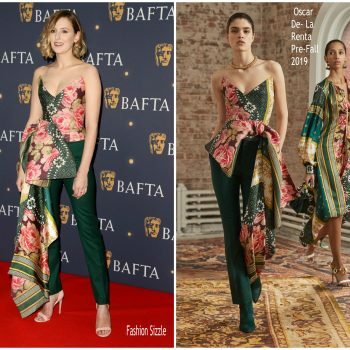 Sofia Vergara attended the ‘SOLO: A Star Wars Story’ LA premiere on Thursday (May 10) She wore a strapless Oscar de la Renta Spring 2018 dress. 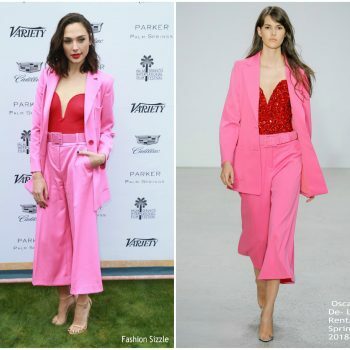 Sofia Vergara and Joe Manganiello attended the premiere of Warner Bros. Pictures’ ‘Ready Player One’ on Monday (March 26) in Hollywood, California. 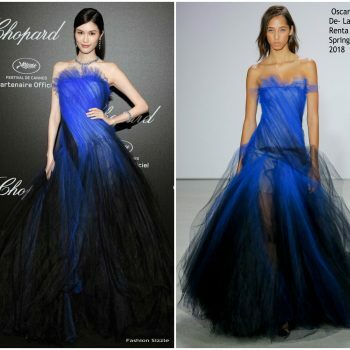 Sofia is wearing a Oscar de la Renta Resort 2018 dress . 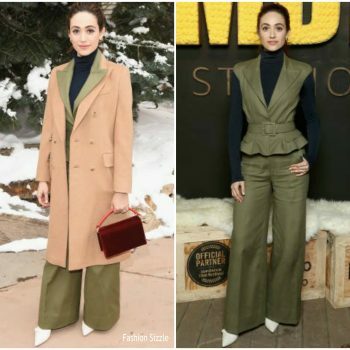 Emmy Rossum attended the IMDB Studio during the 2018 Sundance Film Festival On Monday (January 22), . 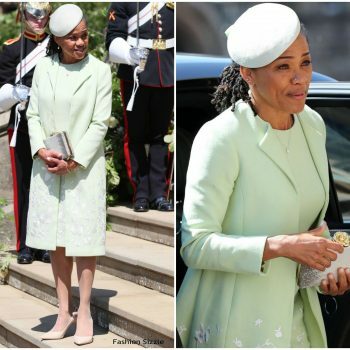 She wore a​n Oscar De La Renta olive green outfit + a Wolford jumpsuit. 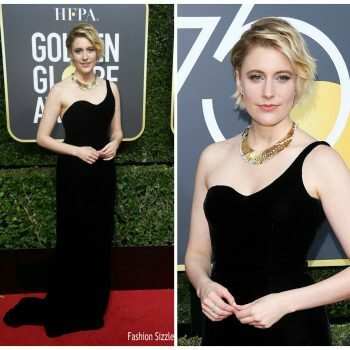 Greta Gerwig was in attendance at the 2017 New York Film Critics’ Awards on Wednesday (January 3) in New York City. 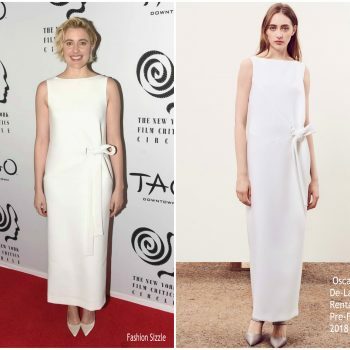 She wore a white Oscar de la Renta Pre-Fall 2018 design. 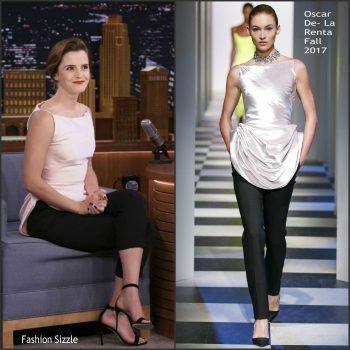 Jessica Chastain attends the New York premiere of 'Molly's Game' at AMC Loews Lincoln Square on December 13, 2017 in New York City. 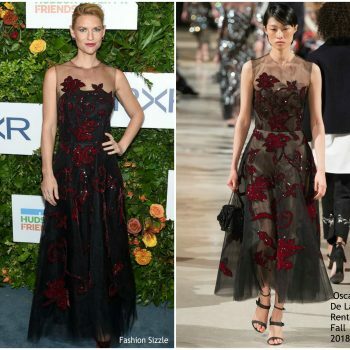 She is wearing a Oscar de la Renta Spring 2018 dress. 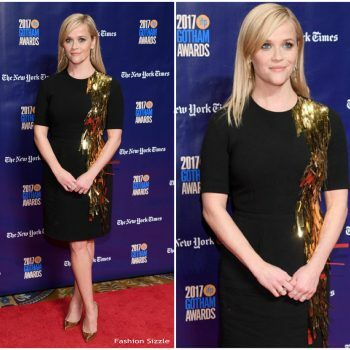 Reese Witherspoon attended he 2017 Gotham Independent Film Awards on Monday (November 27). 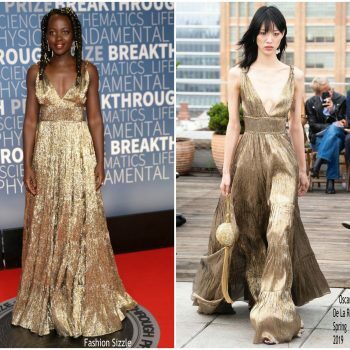 She wore a black Oscar de la Renta dress that has gold confetti embroidery . .
Blake Lively made a guest appearance on ‘Good Morning America’ today (October 16). 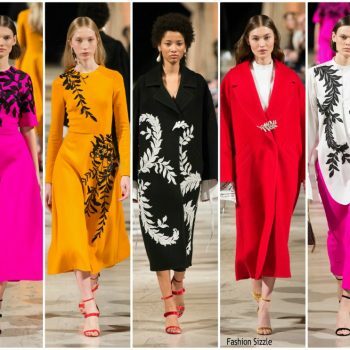 After arriving in wearing Brandon Maxwell she changed into a this Oscar De La Renta Spring 2018 dress. 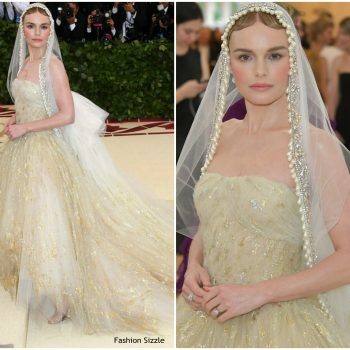 Kate Bosworth attended ‘The Long Road Home,’ in Los Angeles, California premiere on Monday (October 30) She wore an Oscar de la Renta gown styled with Sarah Flint ‘Luisa’ heels. 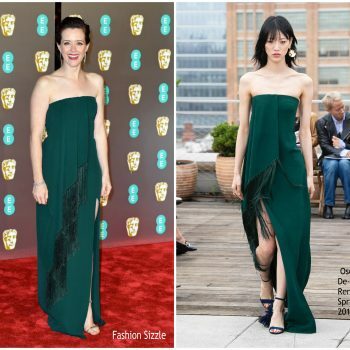 Claire Foy was in attendance at the 2017 Emmy Awards on Sunday (September 17) . 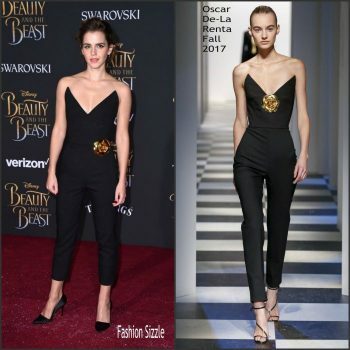 She wore a black custom Oscar de la Renta Resort 2018 jumpsuit. 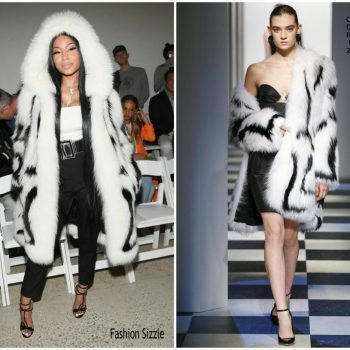 Nicki Minaj wore Oscar De La Renta Fall 2017 to the Spring/Summer 2018 fashion show at New York Fashion Week. 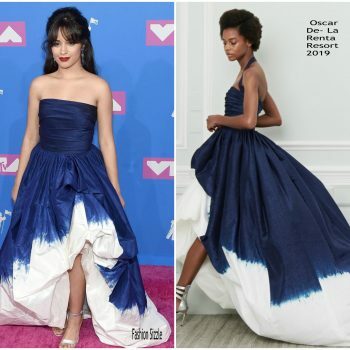 Dove Cameron attended the ‘Descendants 2’ Sao Paulo premiere on Wednesday night (August 16). 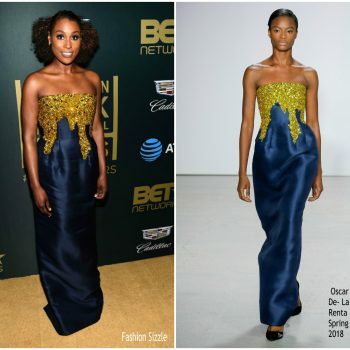 She wore a strapless Oscar de la Renta gown styled with Rebecca de Ravenel drop earrings. 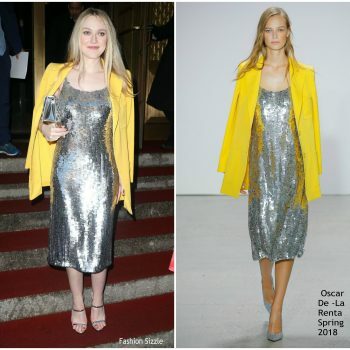 Blake Lively attended at the American Ballet Theatre Spring 2017 Gala on Monday (May 22) in New York City. 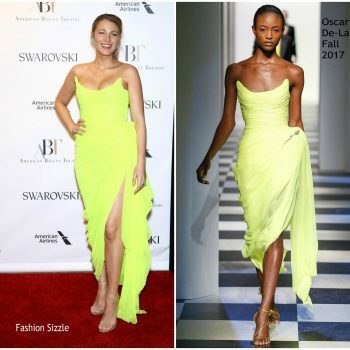 She wore a neon citrine silk chiffon Oscar de la Renta Fall 2017 gown. 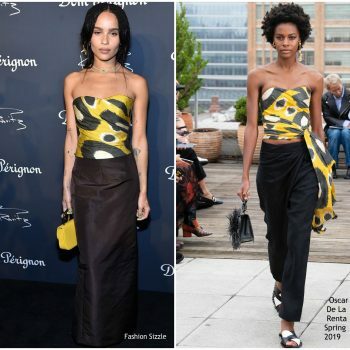 Zoe Kravitz attended the Whitney Museum Biennial in New York City on Wednesday (March 15) She wore an Oscar de la Renta Fall 2017 suit styled with a metallic top. 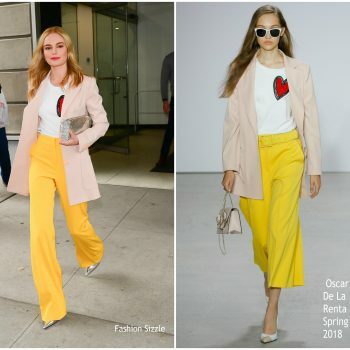 Brie Larson attended the premiere of her new film Kong: Skull Island at Dolby Theatre on Wednesday evening (March 8) in Hollywood. 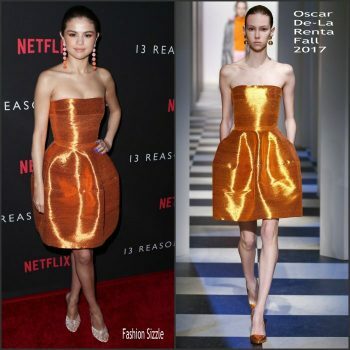 She wore a custom Oscar De La Renta Fall 2017 dress . 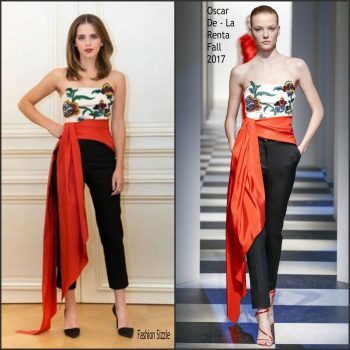 Emma Watson was in attendance at Beauty And The Beast LA Press Conference She wore a custom white Oscar de la Renta Fall 2017 embellished dress with a black bow. 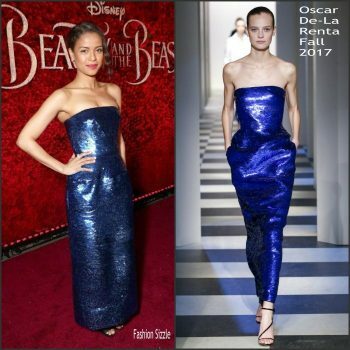 Gugu Mbatha-Raw attended the Beauty and the Beast premiere on Thursday night (March 2) at the El Captain Theatre in Los Angeles. 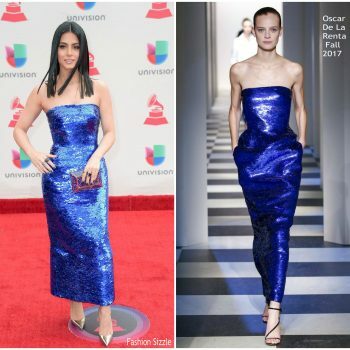 She wore a blue strapless Oscar De La Renta Fall 2017 sequined dress. 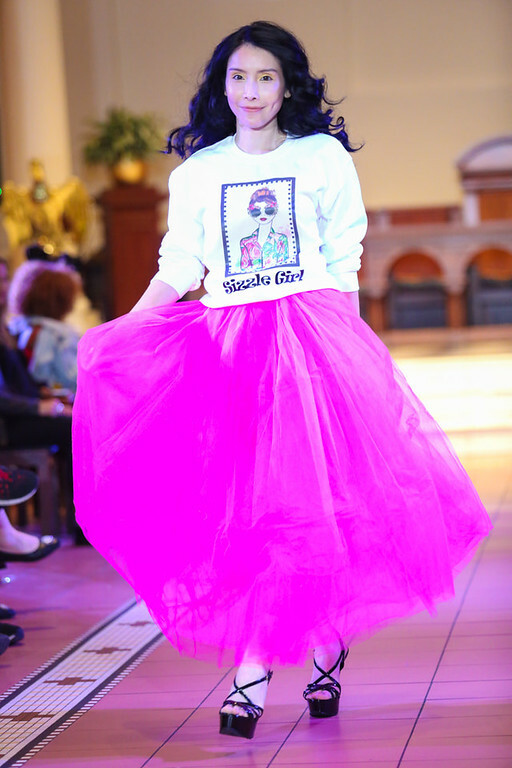 Kiernan Shipka attended FX Network's "Feud: Bette and Joan" premiere at Grauman's Chinese Theatre on March 1, 2017 in Hollywood, California. 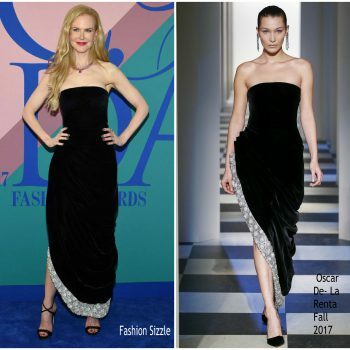 She wore a black Oscar De La Renta Fall 2017 outfit . 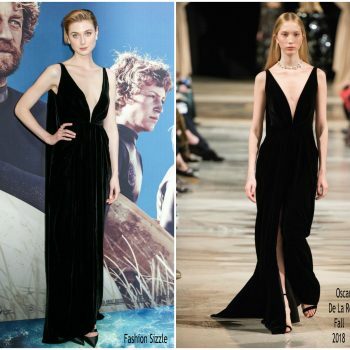 Elle Fanning was in attendance at Live By Night LA Premiere last night. 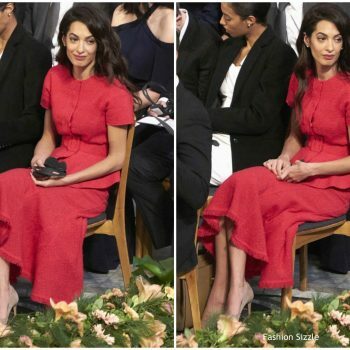 She wore an Oscar de la Renta Spring 2017 dress & a Tiffany and Co necklace . 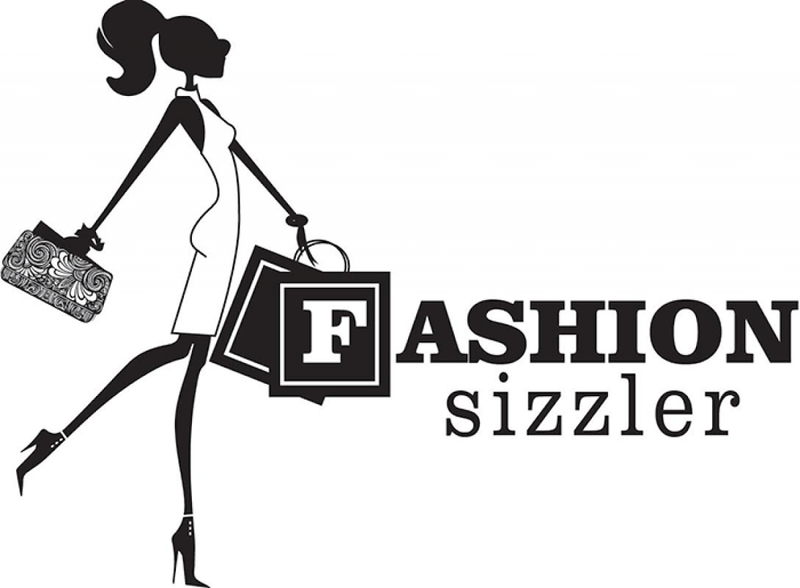 Rita Ora was spotted leaving her TriBeCa Apartment Friday July 22 , 2016 for her judging duties on the new season of America's Next Top Model.